Lipid homeostasis plays a central role in membrane integrity, signaling and cell viability in all eukaryotic cells. Dynamic transfer of lipids from one cellular compartment to another functions in this process; however, our knowledge regarding the mechanisms that control lipid delivery remains limited. The long-term goal of the laboratory is to gain mechanistic insights into how cellular lipid compartmentalization is maintained and understand its role in specialized cells, particularly neuronal cells. In eukaryote, most membrane lipids are synthesized in the endoplasmic reticulum (ER). Vesicular transport, which employs membrane budding and fusion reactions, plays an important role in delivery of newly synthesized lipids to other membranes; however, growing evidence suggests a critical role of non-vesicular transport in lipid exchange at membrane contact sites between the ER and other membranous organelles as well as the plasma membrane (PM). We aim to uncover the function of membrane contact sites, with particular focus on ER-PM contacts, in order to advance our knowledge in lipid homeostasis. Neuronal cells extend multiple processes for efficient neurotransmission; synaptic membranes are highly dynamic and can be separated from the cell body by a significant distance. At distant nerve terminals, vesicular transport is not sufficiently rapid to replenish the loss of PM lipids. 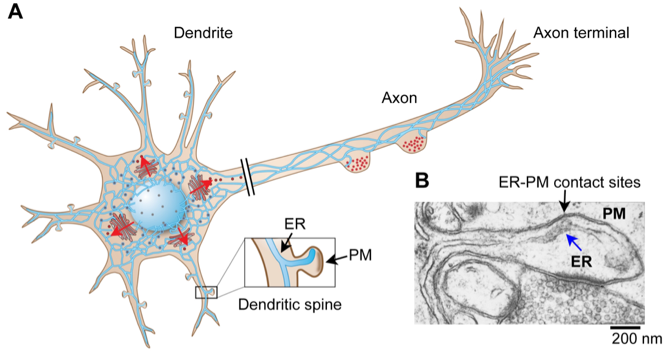 Neuronal processes, including axons and dendrites, are highly decorated with a continuous network of the ER (Figure1). Therefore, non-vesicular lipid transport via ER-PM contacts is likely to have significant roles in maintenance of the neuronal PM. Significantly, mutations in ER morphogenetic proteins have been identified in neurodegenerative disorders including motor neuron diseases. Our working hypothesis is that lipid regulation at ER-PM contacts is critical for the viability of neurons with particularly long axons, including motor neurons. We aim to elucidate the basic principle of lipid homeostasis in neuronal cells and uncover the mechanisms of the progression of neurodegeneration. The potential role of membrane contact sites in lipid exchange is fundamental for our understanding of lipid homeostasis, and these results have broad implications. Moreover, recent human genetic studies revealed the strong link between motor neuron diseases with more common neurodegenerative disorders including Parkinson’s disease, and Alzheimer’s disease. Therefore, the study of motor neuron diseases, and more generally the mechanisms of lipid regulation, may advance our understanding of other neurodegenerative disorders. Figure 1. Maintenance and regulation of the neuronal plasma membrane. (A) The ER extends throughout the neuronal processes and forms physical contacts with the PM. These ER-PM contacts are implicated in lipid transfer, signaling, Ca2+ homeostasis and synaptic plasticity. Red arrows indicate classical vesicular transport via Golgi apparatus, which is absent in neuronal processes. (B) An electron micrograph showing ER-PM contacts at a dendritic spine. Adapted from Synapse Web by Kristen M. Harris.